The ‘London Rhymes’ YouTube channel has launched! London Rhymes (www.londonrhymes.com) has its roots in Hackney, where I (Rosie Adediran) delivered a pilot project with the help of a Sound Connections ‘Innovate’ grant. With Youth Music funding and alongside partner Creative Futures, it has grown to 7 projects across London. 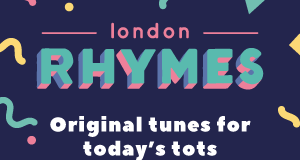 At its heart, London Rhymes is a singing and songwriting project that takes residence in community settings – like children’s centres, playgroups, drop-ins – anywhere where new parents congregate! Myself and a musician from the team set up shop in these settings for around 10 – 12 weeks, getting to know families, drinking a lot of tea, and leading diverse songs suitable to the group (including, as the weeks go on, the songs they’ve written themselves), playing with instruments, improvising together with our talented musicians as well as gently starting to pen new songs together – a genuine collaboration between myself, musicians, parent and their child that often results in wonderful songs full of fun and life, but also which sometimes reflect the challenges of parenting small children. Do have a watch of a lovely 2 minute video which gives you a taste of what it’s all about. And now, we’ve launched a YouTube channel, commissioned by The Space. A selection of our songs have been beautifully animated by an artist called Claire Fauche. Even though these songs were written with small groups of parents in various corners of London, it’s our hope that these songs will be used, sung and enjoyed by families all over the place – it’s the universality of parenthood regardless of background or circumstance that’s reflected in this collection. We hope that you’ll enjoy the songs, and share them with your friends, or colleagues – and most importantly, families that you work with. They’re a completely FREE resource, aimed at families, to sing and listen to within the home and in their everyday life and we’d love your help in getting them there! We have an embarrassingly large box of flyers and we’d love to post some to you if you’ can give them to families that might benefit.